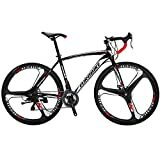 Road bikes (sometimes known in the UK and some other countries as "racing bikes") are lightweight bikes designed for speedy on relatively smooth terrain. These bikes are equipped with narrow wheels and tyres pumped to high pressure, and shaped (including drop handlebars) such that the rider sits in an aerodynamic, stretched-out position. Furthermore the brake-levers and gear shifters are often positioned sich that you can reach them without taking your hands off the handlebars, and hence make speedy gear changes. Although riding one of these bikes, especially at speed, can be a lot of fun, road bikes are not usually the best choice for urban commuting. The bikes do tend to be relatively delicate, the range of gear ratios may not be sufficient if there are steep hills in your area, and the the brakes may not be good enough for emergency stops. Another thing to bear in mind is that road bikes don't usually have mudguards, or even the capacity to attach them - as a result, you can't simply hop on your bike in your work clothes and expect the mudguards to protect them. Furthermore, road bikes made not have braze-ons for a carry rack, and even if you can attach a rack directly to the frame, you do need to remember that road bikes are not designed to carry heavy loads. 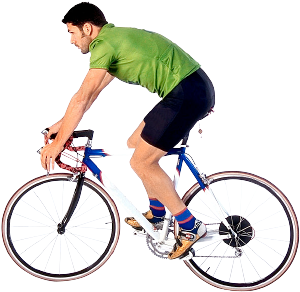 In short, if you're looking for a sturdy durable bike, then a road bike may not be the best choice for you, and perhaps you ought to consider a mountain bike or a hybrid bike. On the other hand, if you think you'll enjoy zipping through country lanes at speed, then a road bike is the ideal choice. Disc Brake System - Provides long lasting and stronger fasting stopping power than the traditional V-Brake Systems. With a lifetime manufacturer's warranty on frames and a one-year manufacturer's warranty on components, you can ride confidently with the knowledge that we've got you covered. (To activate your warranty, professional assembly is required). 3. If you can't assemble the bike by yourself, please take it to your local bike shop for assistance. But you need pay the assemble fee to them. If we have learned one thing over the years, it is that people love the Imola. Given the incredible component set, value, and lifetime warranty it is easy to see why, but we thought we could make it even better. So, for 2017 we decided to upgrade the Tommaso Imola yet again, making it undoubtedly the best value for any entry level road bike on the planet. We upgraded the handlebars, cassette, and brakes to a level that no other bike manufacturer can touch for $499. That's right, the 2017 Imola has a full Shimano Claris Groupset! This full Shimano groupset goes onto the lightweight and ultra-durable 6061 SLA Aluminum compact frame with premium Tommaso Corsa TC20 wheels, making for the best Imola in our history. Unlike other brands, at Tommaso we don't try to save a few bucks by using non-Shimano cranks as we believe your contact point with the bike is of unparalleled importance. The Imola offers 24 speeds of pure power and performance wherever the road takes you. Thanks to the full Shimano Claris drivetrain, the components work together in perfect harmony, for maximum performance. This means the Imola can climb like a dream, while offering the speed you demand on the flats. Unlike other manufacturers who cut cost with no name brakesets, we upgraded the 2017 Imola to Shimano Claris brakes. We did this, because we think stopping on a dime is just as important as going fast. The Imola frame was engineered by our design team using the latest advances in shaped tubing and frame design to produce a lightweight, but powerful frame. Tommaso Corsa TC20 wheelset was designed to be both light and durable, while providing maximum speed and control. The Imola comes equipped with our exclusive UltraCompact handlebar which allows every rider to ride more comfortably in the drops, which reduces your wind resistance and allows you to ride longer and faster. 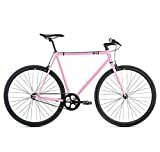 Our brand newproduct Aluminum Road Bike is universally acknowledged as an excellent commuterexpert striving for speed, practicability and fashion. The bicycle featuring lightweight and sturdy frame can perfectly stand for the test of time and terrible roadsituations, which satisfies you with premium racing performance and dailyriding enjoyment. Easy installation makes the convenient parking and storagecome true. Don't hesitate to buy it now! It will never fail your zeal forspeed! The complete bike weighs in at an impressive 24 lbs, the lightest in it's class. Free pedals are included with every bike!